Every year on February 9th, we celebrate National Toothache Day. A holiday devoted to toothaches? We think it’s a bit odd too. But that doesn’t mean we aren’t going to commemorate it! 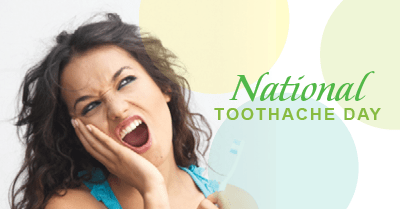 At Long Grove Dental Studio, we want this year’s National Toothache Day to bring out the best in your smile and help you avoid toothaches in the first place. Toothaches are painful and unpleasant. Simply put, they’re really just no fun. However, they can be avoided with good oral hygiene and a proactive dental health approach. At Long Grove Dental Studio, we always encourage our patients to brush properly twice a day, floss at least once a day, and of course, to come visit us regularly for professional cleanings and checkups. Maintaining a good at home care routine and a regular oral hygiene schedule with your dentist in Long Grove not only can help prevent toothaches, it can help protect your teeth for life. Often times, toothaches are your mouth’s way of telling you, “Hey! Something’s not right in here!” and that makes it really important for you to call Long Grove Dental Studio immediately. If you happen to be suffering from a toothache in Long Grove, we encourage you to take action and call us as soon as possible. We’ll perform an in depth examination to determine the cause of your pain and work with you to get you toothache-free and feeling better.